Maureen O'Sullivan TD, Linda Martin and Pauline McLynn. FORMER EUROVISION STARS, Fair City and Father Ted actresses were out in force today all in the name of politics. It’s been 23 years since the issue of banning hare coursing came before politicians in the Dáil, but due to the lottery system, independent TD Maureen O’Sullivan’s Private Member’s Bill will be debated this Thursday with a vote taking place next week. The last Bill calling for a ban was taken by the late TD Tony Gregory in 1993 – and it failed to pass. Hare coursing is facilitated by a hare netting licence from Minister for Arts and Heritage, Heather Humphreys, who has responsibility for the National Parks and Wildlife Service. “Every year thousands of hares are snatched from the countryside, held in captivity for several weeks, and then taken to wire-enclosed fields or racecourses. On coursing day, every hare has to run for its life,” said O’Sullivan. Though muzzled, the dogs can maul the animals, or strike them at high speed, inflicting agonizing injuries. Hares have their bones broken as the dogs crush their bodies or toss them into the air like rag dolls. 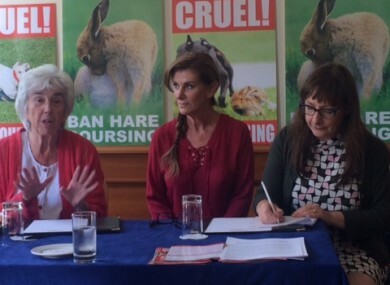 Speaking today, singer Linda Martin said it saddens her to know that Ireland is just one of three countries that allows hare coursing – along with Spain and Portugal. “I truly believe if this went to a public vote, the decent Irish public would vote against it,” she said. This is not a sport. A sport is where you put two teams or two people against each other and they would be of equal weight or equal talent, but this is putting the might and fight of a greyhound against the slightness of a little hare. That’s not sport. That’s just cruelty. She said the electronic coursing is the way to go, stating it does not take away from the event. Politicians are family people as well. Do they really want their kids from seeing it, they should be leading by example. Father Ted actress Pauline McLynn said she is “enormously ashamed” that the department that looks after the arts, also grants the licence to “trap a wild animal”. Hare coursing is banned in England, Scotland, Wales and Northern Ireland. “All around the world we just look like barbarians to have this happening in our country,” said McLynn. Independents 4 Change TD, Clare Daly, who was also at the press conference today, said the public needed to put pressure on political parties in the coming days. O’Sullivan hopes to win cross party support for the Bill. If passed, she said it would end the “horrific practice whereby wild hares are captured by coursing clubs and forced to run from pairs of greyhounds”. The Dublin Central TD said she has been in touch with the party whips and is asking for a free vote on the issue. She said this should be accepted, after all, it is the era of “new politics”. She said she has discussed the matter with a number of Fianna Fáil and Fine Gael members who have said they are against hare coursing, but cannot go against party policy. Other politicians backing the initiative are Senators Lynn Ruane, Alice-Mary Higgins and Frances Black. A senior government source said it would be opposing O’Sullivan’s Bill. Minister Humphreys is due to outline the government’s position later this week. Email “'This is not a sport, it's just cruelty': Irish TV and music stars support ban on hare coursing ”. Feedback on “'This is not a sport, it's just cruelty': Irish TV and music stars support ban on hare coursing ”.